One-Way Tickets To Florida: Puerto Ricans Escape Island Woes Life in Puerto Rico is tougher than ever. The U.S. territory — popularly known as "the island of enchantment" — faces a decaying economy and escalating violent crime rate. Many residents are leaving the island in record numbers and embracing the mainland as home. 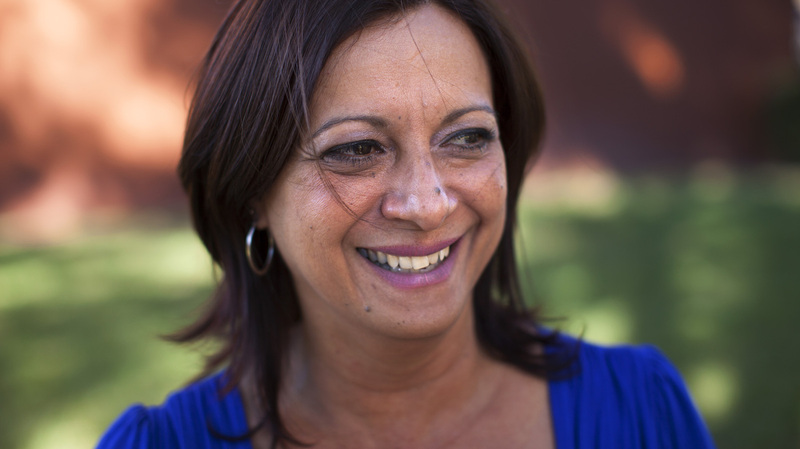 Arlene Bonet settled in Orlando, Fla., after her Puerto Rico real estate business crashed. She's now working for a Puerto Rican cultural organization in Orlando, while her son and mother still live in her hometown, Cabo Rojo, Puerto Rico. Puerto Rico's population is dropping. Faced with a deteriorating economy, increased poverty and a swelling crime rate, many citizens are fleeing the island for the U.S. mainland. In a four-part series, Morning Edition explores this phenomenon, and how Puerto Rico's troubles are affecting its people and other Americans in unexpected ways. According to the most recent census, the 4.6 million Puerto Ricans living on the U.S. mainland now surpass those on the island of Puerto Rico. For years, they've been migrating out of the U.S. Caribbean territory — many to escape the escalating crime rate and economic crisis. In Kissimmee, south of Orlando, many of the signs are in Spanish, and some businesses resemble what you might find in a city like San Juan. One of those businesses is Miguel Fontanez's restaurant, Pioco's Chicken. It's a spot that was started by his father, also named Miguel. The elder Fontanez owned a chain of successful restaurants in Puerto Rico. But in 1996, he brought his family to Central Florida after his brother, a police officer, was killed. Miguel Fontanez Sr., the owner and founder of Pioco's Chicken in Kissimmee, Fla., serves customers at his restaurant. He opened the restaurant 11 years ago, and it has become a hub for the area's large Puerto Rican community. 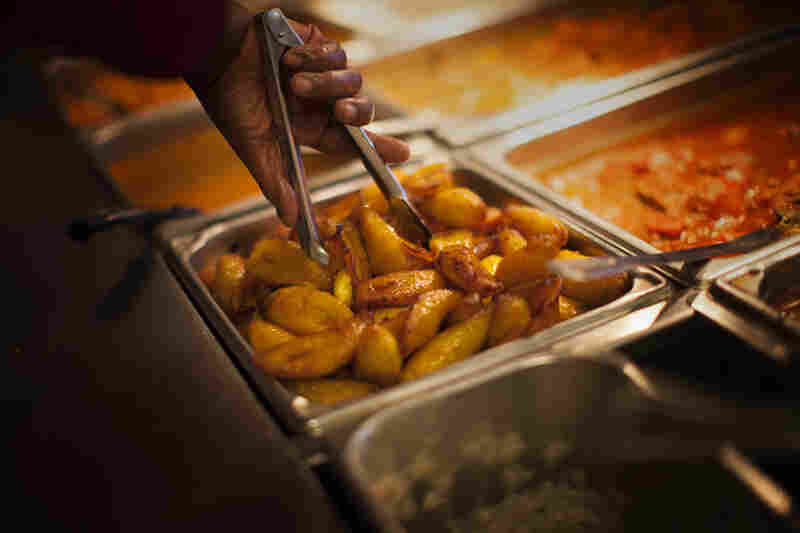 A worker prepares plantains at Pioco's Chicken. 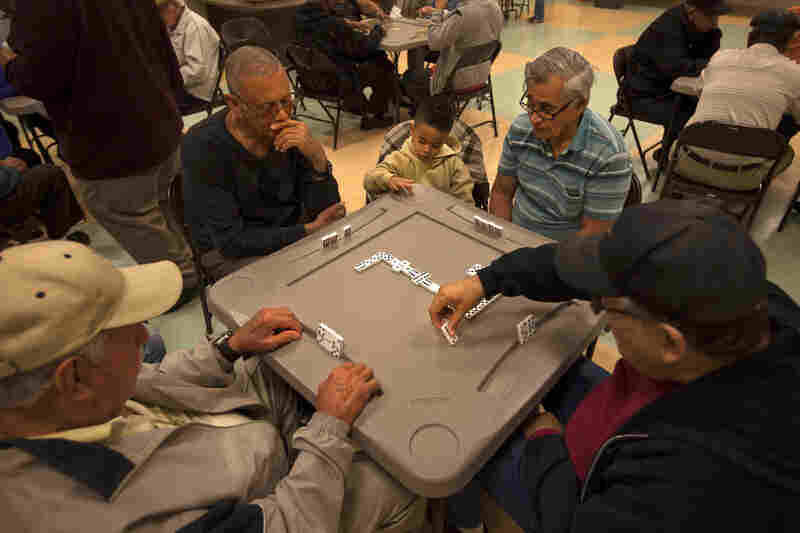 A group of men plays dominoes at the Robert Guevara Community Center in the heart of the Buenaventura Lakes neighborhood in Kissimmee. Today, Florida has replaced New York as the primary destination for Puerto Ricans coming to the mainland. 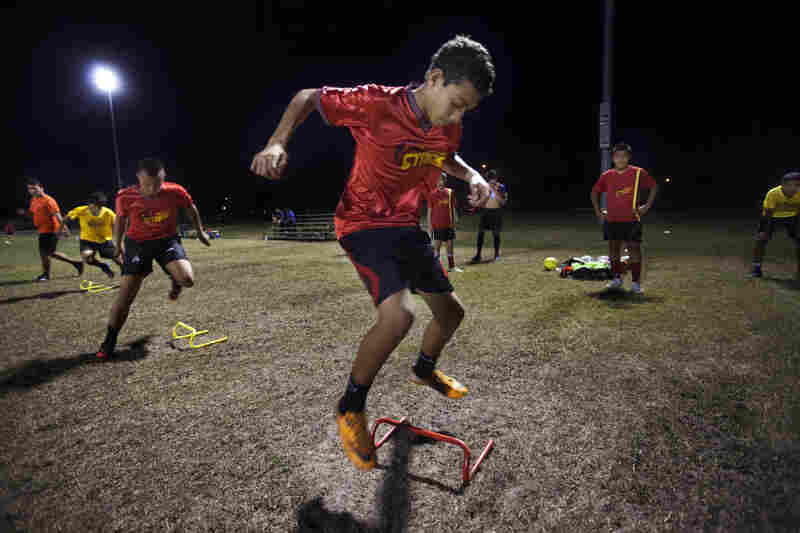 Louis Jimenez, 14, attends soccer practice for his team, the Orlando Stars, at the Archie Gordon Memorial Park in Kissimmee. Melissa Colon dances in a zumba class at the Robert Guevara Community Center in Kissimmee. Bingo caller Zinnia Rosado of St. 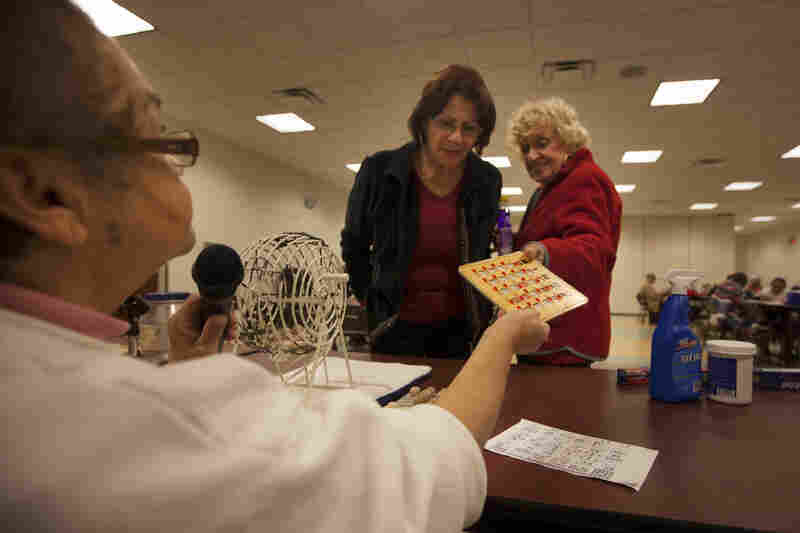 Cloud, Fla., checks a winning bingo card at the Robert Guevara Community Center. "It was very bad; it was very tough," Fontanez says. "So [my father] just wanted to move somewhere fresh and start something different. And my grandmother at that time was living already here. So the first place that came to mind was Florida." Many of his customers, he says, are still newcomers from the island. "Just last week, I had a big group, a family that just moved from Puerto Rico here because of the economy, because it's very bad," Fontanez says. "They're more in the truck business, and over here it's expanding more than over there." Other businesses — larger endeavors — are also migrating from the island. A number of Puerto Rican colleges and universities have opened campuses in Central Florida, offering bilingual education to the area's fast-growing Hispanic population. Mech Tech Institute, for example, is a technical school that launched its first U.S. campus last year in Orlando at a defunct Saturn dealership. The institute offers training in everything from heating and air-conditioning repair to diesel machines. The connection between Florida and Puerto Rico stretches back decades. But many say the Big Bang — the event that created the huge wave of Puerto Rican migration — came on a specific date: Oct. 1, 1971, the day Walt Disney World opened its doors. Disney World, and the theme parks that came after it, created thousands of jobs in an area that had been largely rural. Opportunities were especially ripe for bilingual speakers like John Quinones, a Puerto Rican who's now a commissioner in Osceola County. "I used Spanish a lot," Quinones says. "A lot of the [people from] Latin American countries that would come to visit the parks — that would certainly cater to them." Quinones was 14 when his family moved to the area from Puerto Rico. He worked at Disney World's Frontierland, at the Pecos Bill cafe, to support himself while in college. Some of the Puerto Ricans in Osceola County say they came to be with family, some to get away from rising crime. But many, like Arlene Bonet, moved to find work. Bonet came from what she describes as a beautiful area on Puerto Rico's southwest coast — a town called Cabo Rojo. "I used to live right on the corner by the beach. I used to go every day to the beach to see the sunsets," she recalls. She says she misses those sunsets and the mountains nearby, where she would meditate and practice yoga every Sunday. Her town is a vacation area, and for many years, she made a good living selling real estate. "But then the economy and the bubble exploded all around the world, and real estate went down, mortgages went down, and business went down too," she says. 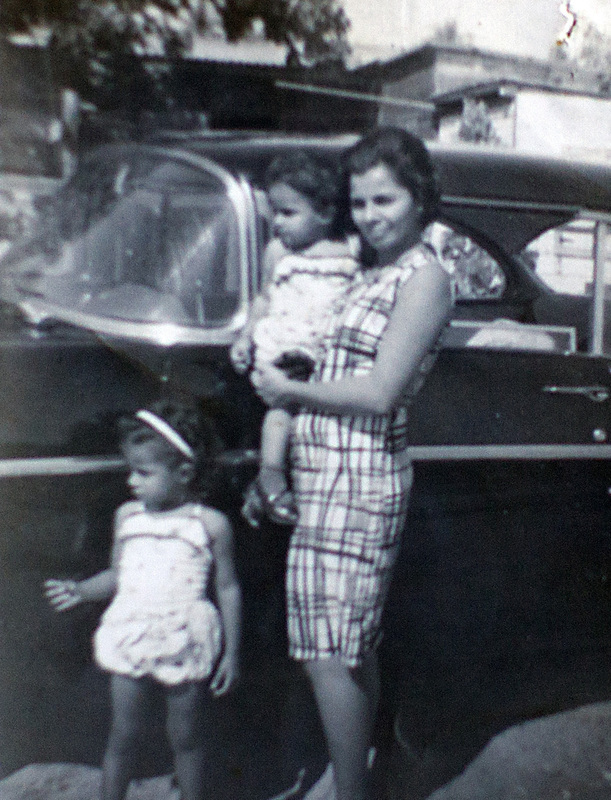 Arlene Bonet (right), shown with her daughter, Didra, and her sister Genoveva (left), lives in Orlando, Fla. Bonet's daughter, who works part time and attends college part time, lives with her. 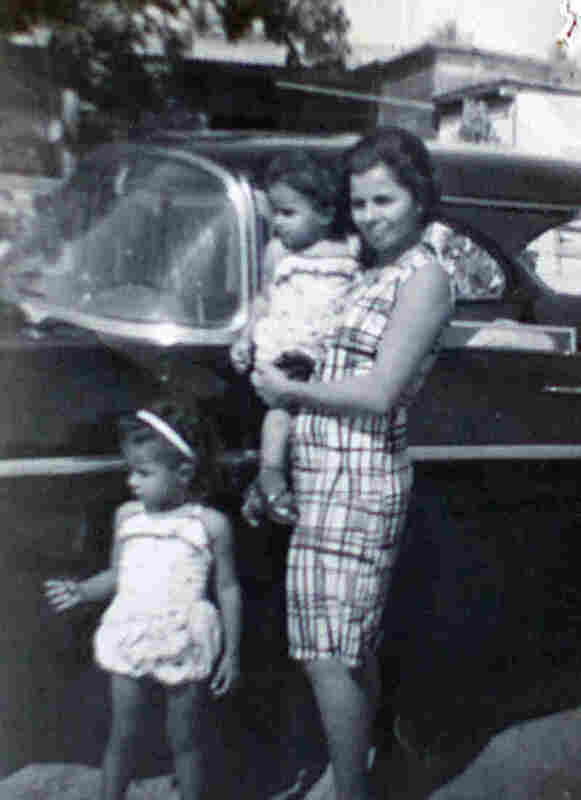 In this family photo, Arlene Bonet and her younger sister Genoveva are seen with their mother, also named Genoveva, in Puerto Rico. Bonet says she did what she could to keep going. She laid off her four employees and went back to school to get her MBA. But then Puerto Rico went into what she calls a second, politically driven downturn. To combat a massive budget deficit, Puerto Rico's government laid off thousands of public employees. Bonet's business was dead, and she saw no signs of when it might come back. After moving to Central Florida with her daughter, Bonet says finding a job wasn't easy. But now that she has one, she's grown to love the area and has no plans to return. "It's pretty much like a Caribbean island because it's sunny, it's fresh, it's beautiful," she explains. "So we feel like it's home." While the move was hard on her daughter, Bonet says it was crucial — both for her future and her eventual grandchildren. "That's one of the reasons also I moved," Bonet says. "It's not just thinking about me. What kind of life can I give my grandchildren in the future if Puerto Rico, instead of going up, is going down?"